Seal Island in False Bay is one of the most highly sought after locations for shark expeditions. 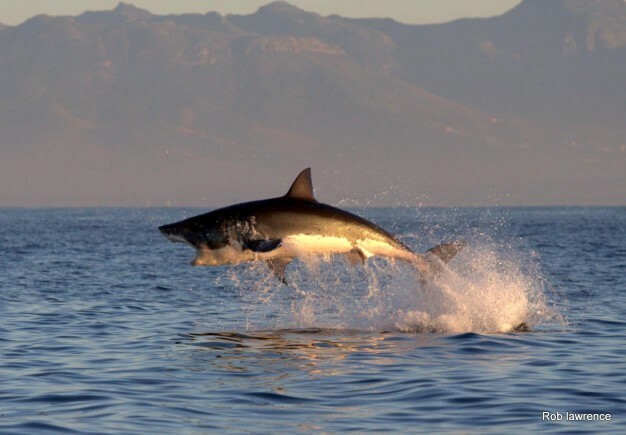 False Bay is a 30 -35 minute drive from Cape Town City Centre and is home to one of the world’s greatest wildlife phenomena – the breaching great white sharks. Thanks to Chris Fallows for providing shark information below. Images of these magnificent predators abound but very few people know that Seal Island is the only place in the world where this incredible feat takes place. The secret to this unique behaviour is quite simply Seal Island itself. The island is 400 m long and 80m wide and crammed with over 60 000 seals. As Chris says, “It’s a great white shark supermarket bursting at the seams” Great white sharks start to congregate around Seal Island in April each year as the inexperienced young seals start leaving the island to forage on their own after months of being fed their mother’s milk! 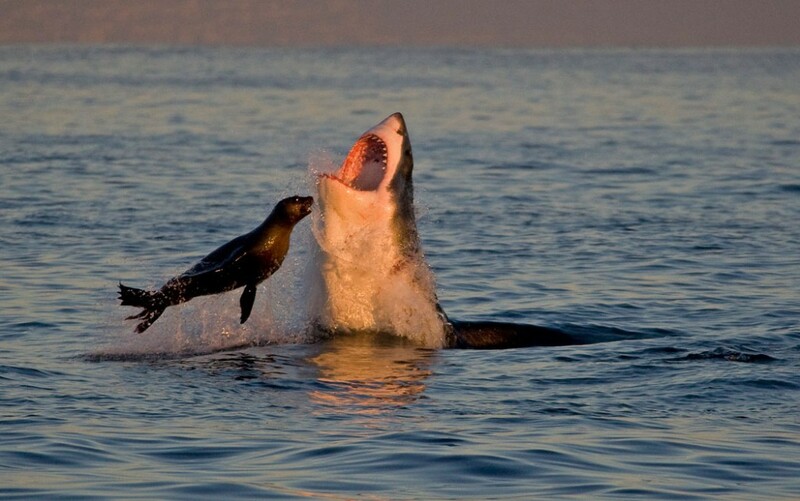 The relatively defenceless seals, high yielding prey are pursued by athletic sharks in a setting that is perfect for “ambush attacks”. 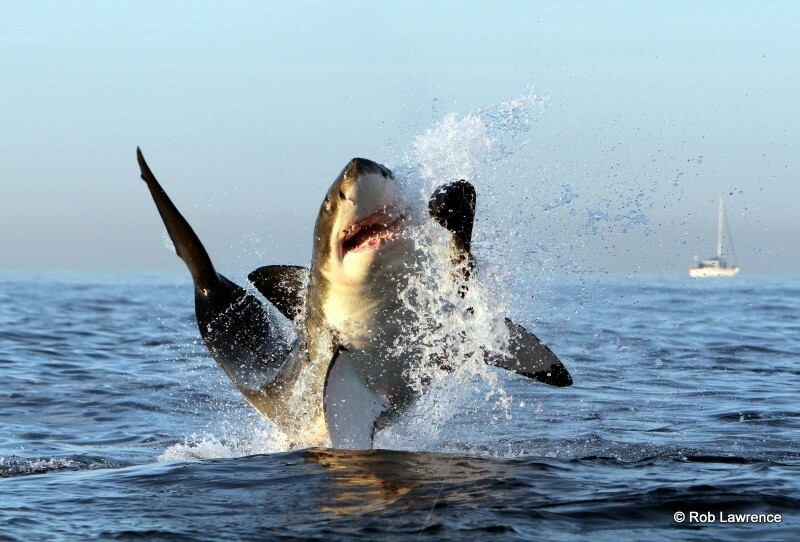 80% of all great white attacks that have been witnessed take place half an hour before and after sunrise making the morning trip an exceptional opportunity to view a breaching great white shark. 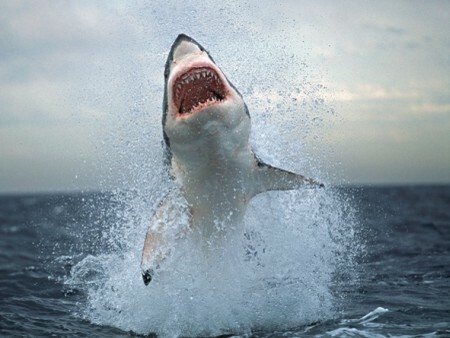 Early in the season, the sharks tend to scavenge more than hunt and most of the sharks are sub-adult sharks with an average size of 3.5 metres. Peak shark season is from June- August when there is a regular exodus of the young seals. Competition is strong amongst the sharks during this period, but the older more experienced sharks tend to hunt up to 3.5 km away from the island as the concentration of shark vs seal is less but their chances are better that another shark won’t steal their prey! Shark cage diving and viewing season has opened in False Bay and this highly prized spectacle is one of those experiences to tick off the bucket list. It is highly recommended to book early as the False Bay Season is a “winter” phenomenon and season usually closes in September so the trips (especially the morning trips) get booked out early. Bookings can be made through Cape Point Route – call 021 782 9356 or CLICK HERE to enquire. 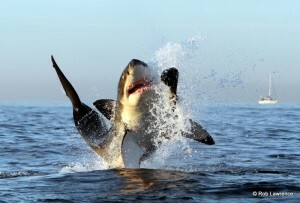 There are 2 shark cage diving operators in False Bay. See trip details for each below. Explore Beautiful False Bay with Apex Shark Expeditions, owned by Chris and Monique Fallows of BBC’s Planet Earth, Discovery Channel’s Air Jaws and National Geographic fame. Trips depart from Simon’s Town and they specialize in small groups with four guides on board. All shark cage diving is on snorkel so a dive certification is not required. All equipment, lunch and refreshments provided. Apex offers 2 trips per day. Join African Shark Eco-Charters on an eco-friendly Great White Shark cage diving & viewing trip. Trips depart from Simon’s Town. We take small groups & a maximum of 2 people in the cage. The average dive time is 20-30 minutes. No diving experience necessary. All dive gear, and light snacks and refreshments are provided. African Shark Eco-Charters are the only operator in False Bay accredited with “Fair Trade in Tourism”. Morning trips are from 07h00 – 12h30 Afternoon trips are from 13h00 – 17h00. Morning trips are from 07h00 – 12h45 Afternoon trips are from 13h15 – 17h00. 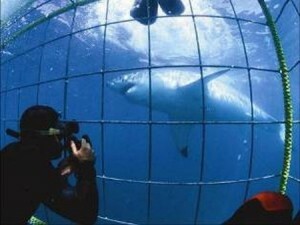 This entry was posted in Activity, Wildlife and tagged Great white shark Diving, Shark Cage Diving False Bay, Shark Cage diving Simon's Town, Shark Viewing. Bookmark the permalink.